Launching the new pea variety, Maki, with its high, stable yields and high quality protein was an important milestone for the Pork CRC and a big step forward for the Australian pork industry. Maki will be released commercially next year with agronomic information for growers. Information on the available energy for pigs and other species will also be available upon release. It’s sure to be welcomed by pork producers and grain growers. Producers and stockfeed companies, particularly in northern NSW and Queensland, are continually looking for flexible, high quality protein sources, such as field peas, to be included in their pig diets. Maki’s development was a major part of the Pork CRC’s Program One, which aims to secure a more reliable and consistent supply of protein and energy for pig diets. It promises higher yields for growers and improved nutrient levels for pork producers. The project involves Adrian Russell, Managing Director and Principal Plant Breeder of Plant Research New Zealand, University of Sydney, Pulse Australia, grain growers and pork producers, including members of Cameron, Hall and McLean. Providing the maximum digestible energy for pigs at the lowest cost is a major research area for the Pork CRC, which has also developed two new barleys and a triticale. 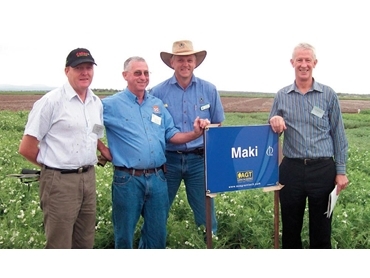 Steve Moore, Officer in Charge of the IA Watson Grains Research Centre at Narrabri, NSW, described the release of Maki as a giant step forward for field peas that will significantly increase the reliability and performance of the crop. He said its release could help make field peas a 50,000 ha crop in central and northern NSW and the Southern Qld cropping zone. Extensive testing throughout the region showed Maki out-yielding other varieties. Maki is classified as a green seeded blue pea. It has low hard seed count, a desirable agronomic and quality trait. The seed has a low bleach score, which is also desirable. Tests on Australian grown seed confirm that Maki has a low level of trypsin inhibitor - an important consideration when used for feed. Maki also has great potential for other livestock. Beef cattle producers are increasingly appreciating the benefits of supplementary feeding, with demand for high protein supplements such as field peas expected to increase. Industries such as beef and lamb feed-lotting, dairying and poultry require a steadily increasing supply of high protein feeds.